Warm, sunny, calm, what all guides and guests crave when fishing in the Charlottes and today was that day! 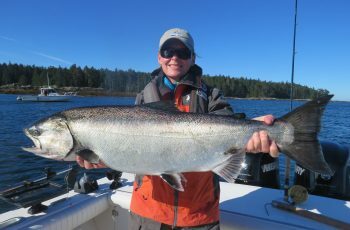 Perfect fishing conditions, and some tyee caught, some released, all in all what a fantastic Saturday here at Langara. I headed west this am, a bit foggy, flat seas and crisp air. I had Matthew Williams and Wendell Zerb aboard and we dropped our lines in about 8am. Slow fishing til the morning slack when Wendell grabbed a 25 lber to start his day off. Matthew, all the way from the Dominican Republic, practiced on a 18 lber he released, then a stern rod buckled, a mooching rod with 8 ounces of lead thumped pretty good with a head shake. Quickly Matthew grabbed the rod and the fight was on, several big head shakes and a long run, followed by some sulking. Fifteen minutes later we slipped the bag around a 32 lber, quickly into my live tank and then a measuring job. A nice photo and off she went quickly and full of power. Another tyee wins! Set free on a sunny day to continue on course finding her river to complete her life cycle. 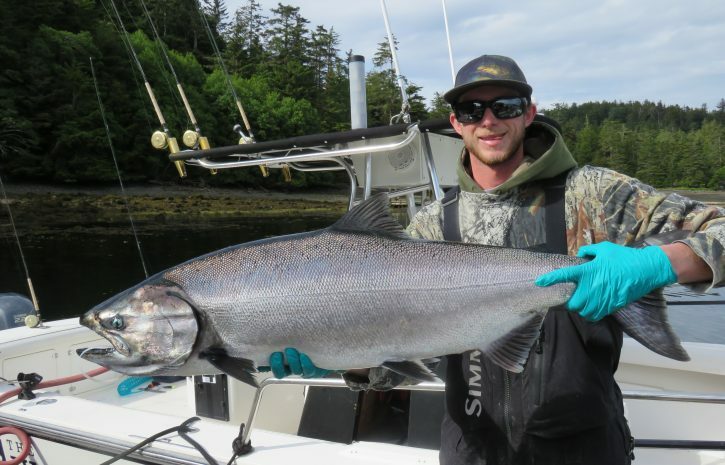 Matthew should be proud as his was the single released tyee of the trip, way to go, WINNING! We had a good day in here, seven tyee added to our total, now eleven for the trip. Cecil Bond had top fish with Kory, taken yesterday at the reef. Graeme Currie had a 31, Louis Montprllier had a 33 lber. Bud stumbled on a 33 with his guests, up at the lighthouse, 40 feet on the cable, somewhere between Wash and the Light. 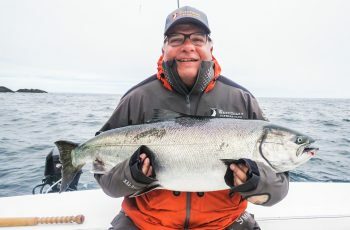 The Nyrose group had a nice fish of 34 lbs, for Greg Warkentin. 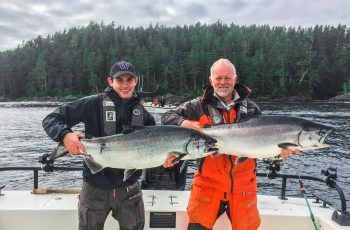 The Nelson group had two great fish, a 36 lber for Bruce Miller SR., and Erik Nelson angled a 33 lb tyee. The Brass group had three tyees today, I heard the guide calling for measurement charts on the west side on channel 9 frantically….guides, always have your tapes and charts handy this time of year! 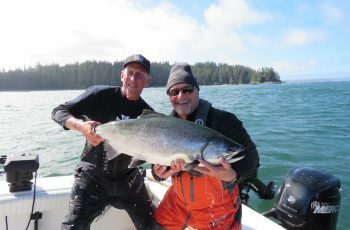 So, not to shabby, tyee are around, Chinook fishing good, weather perfect, big smiles and happy guests tonight. 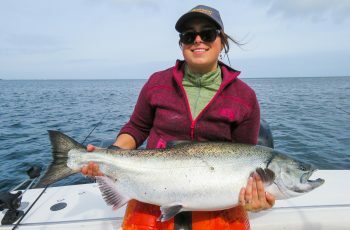 Fishing has slowed a bit since the frenzied action first two weeks of June, but things point to a great trip ahead. I hope I have a story for you all tomorrow with a new group arriving, these are fantastic days here at Langara. Check in tomorrow.